Customer Lifetime Model: Here is a graphic way that will help you relate the cost of customer acquisition and support to the value of a customer’s business over the lifetime of doing business with you. In the model below you should aim to be in the lower right quadrant. Everyone will tell you that repeat customers cost less to acquire than new ones. It may be stretching the term ‘tool’ by applying it to the matrix on the right, but the idea is for you to use the customer lifetime model to approach both product design and marketing, as well as your evolving customer support policy. In other words you want to ensure that the customer stays with you for a long time with repeat orders and that the product you supply has low costs of being supported. It is another way of looking at customer satisfaction. You want to avoid incurring the cost of constantly returning to sell to the same customer, at the same level of capturing a brand new one. At the same time, you want to be selling something that does not require constant modification or repair. This kind of analysis should lead you to supply a better quality product in the first place, and one that resells itself with minimal intervention from you. It is not just a matter of the razor and the razor blade. My advice is to establish a close relationship with customers that does not require high expense per customer and an enduring customer lifetime model. An example of this in B2B, might be to hold user conferences, or when the customer is buying one product it is one of a range that supplies several slightly different needs. Think too, about the value of customer referrals. The networking value of them is a big multiplier. But don’t seek the referrals in a blanket fashion. The efforts have to be tailored to suit each particular client. I certainly found that in the 11 years that I ran my main business, the social connection paid enormous dividends and was a pleasure, through the development of positive relationships. In the consumer area, you can of course look at data that will have more data points than in B2B. You can look at numbers like, the percentage of customers who order each each year, the annual spend of each customer, or the amount spent. Don’t forget at the same time, to assess the direct and indirect costs per year of servicing those customers. Think about the value of the product or service that you deliver to your customer. It’s easy, because that’s how you market your product. In a similar way, think about how much the customer will be worth to you over the course of their lifetime with your business. You can calculate how much they spend with you, how frequently and how much, and the cost of servicing the sale (proportional promotional spend, or visits, for instance), over a given period. Or, you can do so in broad brush ways that will give you a sense of how much better value you get from long term repeat business, than you get from new sales or customers requiring significant time to support. What you will inevitably find is that keeping satisfied customers brings greater value than new customers, unless they are converted into long term ones. Clearly you want to build your numbers of long term repeat customers. 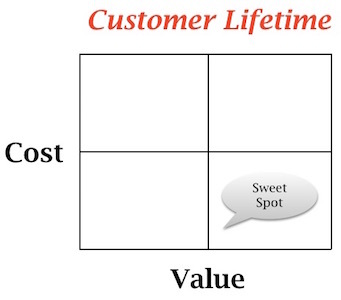 Understanding the customer lifetime model, will help you do just that. Today’s business founders appreciate that being connected to the social fabric of the world they inhabit is not simply good public relations, but is a fundamental building block of sustainable business. If you want to go deeper, then visit Geoff Fripp’s Guide Customer Lifetime Value (CLV), and especially his Simple CLV Formula. As you perfect your marketing and sales strategy, there is other helpful material on venturefounders.com: on data reliability, the sales funnel, and critical success factors. If you go back to the landing page, you should look at Insights—Marketing and the Tools sections.